Last week, I attended the Reserves Experience, an MOD-run event in London to build awareness and understanding throughout the Civil Service of what it means to join the Reserves - whether the Royal Naval Reserve, the Royal Marines Reserve, the Army Reserve or the Royal Auxiliary Air Force. Almost a 1000 Whitehall-based colleagues attended over 2 days, both those who might consider joining up and managers who want to learn more. I thought it was a fantastic experience, including an opportunity to take part in a mock scenario of the armed forces being deployed to Africa on a humanitarian mission. In the hour-long exercise you get to understand the importance of information and intelligence, communications and force protection, to meet Reservists and regulars from all the services and interact with equipment. I particularly enjoyed the shooting-practice simulation – I managed 8 hits out of 10! So, why the focus on Reserves in the Civil Service? Firstly, the Reserve Forces are a valuable and highly valued part of our Armed Forces. They are vital to the delivery of the nation’s security at home and overseas. National recruitment efforts have been stepped up, aiming for an overall Reserve force of 35,000 by 2020. You will all hopefully have seen the individual service advertising campaigns that are running at the moment. Secondly, the Civil Service is a significant source of volunteers for the Reserves, with over 1,000 civil servants already in their ranks throughout the length and breadth of the country. I believe it is partly the shared values of public service that make civil servants more inclined to join the Reserves, and that this number can grow further. In fact, we’re committed to getting at least 1 per cent of civil servants into the Reserves - a goal the Prime Minister enthusiastically supports. On an individual level, the Reserves provide a great experience that can help develop your capabilities in your Civil Service career. Being a Reservist provides opportunities to develop leadership, team building, communication and analytical skills (among others) in a different and unique environment. I meet a wide range of civil servants who are members of the Reserve Forces and am always struck by several things. The variety of roles in which they are engaged, beyond the more well-known combat roles, is truly astonishing. I have met Reservists who serve in media operations, stabilisation missions, logistics and intelligence roles - to name but a few - many of which have direct relevance to the Civil Service. For example, I spoke to reservists recently returned from training Ugandan and Burundian forces, and to some of the psychological operations team. As we put a greater emphasis on leadership in Civil Service reform, I believe that most of the principles instilled in military leaders are those that we value in the Civil Service. These are skills you can develop in the Reserves and which line managers of civil servant Reservists can recognise and value back in the workplace. 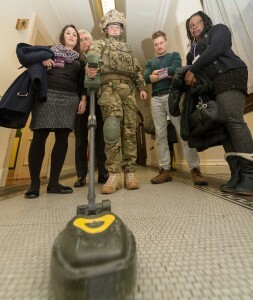 Many line managers at the Reserves Experience commented positively on the variety of roles available and how relevant they are to the Civil Service. Supportive employers are essential to recruiting and retaining Reservists, allowing them to balance their career and Reserve commitments, alongside their personal lives. Central government aspires to be an exemplary employer. As such, we have improved our HR offer to civil servant Reservists. We are moving towards almost all civil servants being offered at least 15 days special paid leave to carry out their Reservist duties, and encouraging Reserve service as development activity that brings back new skills and personal qualities to the workplace. A network of Reserves champions is also now established across departments. They are your local point of contact for questions about Reserves. There are many ways to develop your skills and experience outside the workplace, and joining the Reserves will not be for everyone. But I do challenge you to think beyond the stereotypes and look into the broad range of opportunities available in the Reserves, wherever you live, and the broad range of people who are Reservists. The Reserves Experience may be coming to a place near you in 2015! Is there a list available of Reserve Champions? I work in a relatively small Agency and fear I may be the only Reserve here.. Your HR department will know who your reserves champion is and be able to provide contact details. I am the Reserves Champion for HMRC but I also cover VOA and other agencies have similar arrangements with departments.